Open an RGB image with 3-4 bands in Python using Rasterio. Identify the number of bands stored in a multi-band raster in Python. Plot various band composites in Python including True Color (RGB), and Color Infrared (CIR) color images. Earlier in this course, you worked with raster data derived from lidar remote sensing instruments. These rasters consisted of one layer or band and contained height values derived from lidar data. 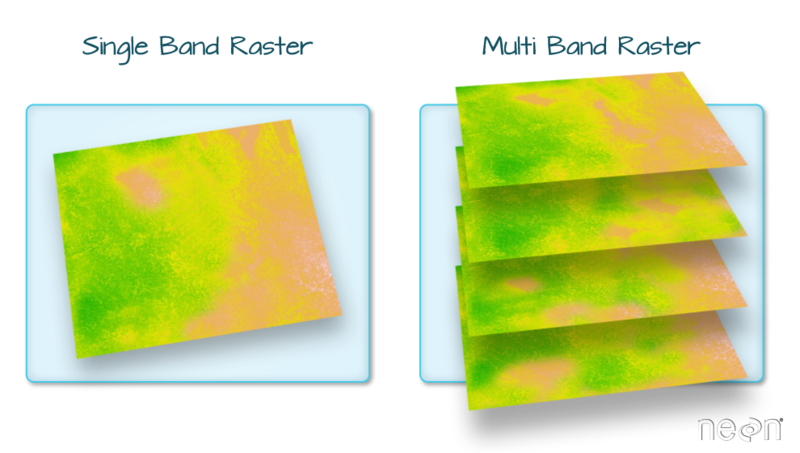 In this lesson, you will learn how to work with rasters containing multispectral imagery data stored within multiple bands (or layers). Just like you did with single band rasters, you will use the rasterio.open() function to open multi band raster data in Python. If your multi-band data are imagery that you wish to composite into a color image, you can use the earthpy plotRGB() function to plot a 3 band raster image. A multiband image has more than one layer. You can plot bands individually just like you plotted lidar height rasters earlier in this course. A color image is just a composite of the red, green and blue bands of the data. Here NAIP data are used to plot a color RGB composite image. Note there are four bands below. You are looking at the red, green, blue and Near infrared bands of a NAIP image. What do you notice about the relative darkness / lightness of each image? Is one image brighter than the other? You can plot each band individually to better look at reflectance values. In python you would usually create this plot using a loop. However the plot_bands function in earthpy will plot all bands for you automatically. You can plot the red, green and blue bands together to create an RGB image. This is what you would see with our eyes if you were in the airplane looking down at the earth. If the image has a 4th NIR band, you can create a CIR (sometimes called false color) image. In a color infrared image, the NIR band is plotted on the “red” band. Thus vegetation, which reflects strongly in the NIR part of the spectrum, is colored “red”. CIR images are often used to better understand vegetation cover and health in an area. Near infrared light reflects strongly off of vegetation. When you plot a near infrared band from remote sensing images on the red channel, vegetation is emphasized. Time series: the same variable, over the same area, over time. We will work with time series data later in the semester. Now, we have learned that basic concepts associated with a multi-band raster. Next, let’s explore some spectral imagery in Python to better understand our study site - which is the cold springs fire scare in Colorado near Nederland. In this lesson, you will work with NAIP data. NAIP data access: The data used in this lesson were downloaded from the USGS Earth explorer website. Next, you will use NAIP imagery for the Coldsprings fire study area in Colorado. To work with multi-band raster data you will use the rasterio and geopandas packages. You will also use the spatial module from the earthpy package for raster plotting. Before you get started, make sure that your working directory is set. Remember that it is ideal to use a context manager to open raster data in Python. This ensures that the data connection is properly closed. Where src can be whatever variable name you select to store the raster object. Above you imported a geotiff like you’ve done before. But this file is different. Notice the shape of the resulting numpy array. How many layers (known as bands) does it have? Just like you’ve done before, you can plot a single band in the NAIP raster using imshow(). However, now that you have multiple layers or bands, you need to tell imshow() what layer you wish to plot. use arrayname to plot the first band of the image. Plot showing band one (red) of the NAIP data from 2015. Or you can use the earthpy function plot_bands(). Note that in this lesson, you will first be shown how to use earthpy to plot multiband rasters. The earthpy package was developed to make it easier to work with spatial data in Python. Plot showing band one (red) of the NAIP data from 2015 using the plot_bands() function. Look closely at the count element in the metadata for your raster. Note that now, the count is 4 rather than 1. This is because you have multiple bands in your raster, one for each ‘color’ or type of light collected by the camera. For NAIP data you have red, green, blue and near infrared bands. When you worked with the lidar rasters in week 2 your count was 1 as a DSM or DTM is only composed of one band. Data Tip: Remember that a tiff can store 1 or more bands. It’s unusual to find tif files with more than 4 bands. Next, examine the raster’s min and max values. What is the value range? This raster contains values between 0 and 255. These values represent degrees of brightness associated with the image band. In the case of a RGB image (red, green and blue), band 1 is the red band. When we plot the red band, larger numbers (towards 255) represent pixels with more red in them (a strong red reflection). Smaller numbers (towards 0) represent pixels with less red in them (less red was reflected). To plot an RGB image, we mix red + green + blue values, using the ratio of each. The ratio of each color is determined by how much light was recorded (the reflectance value) in each band. This mixture creates one single color that, in turn, makes up the full color image - similar to the color image that your camera phone creates. It’s important to note that this image is an 8 bit image. This means that all values in the raster are stored within a range of 0:255. This differs from a 16-bit image, in which values can be stored within a range of 0:65,535. In these lessons, you will work with 8-bit images. For 8-bit images, the brightest whites will be at or close to 255. The darkest values in each band will be closer to 0. You can plot a single band of your choice using numpy indexing. naip_csf will access just the second band - which is the green band when using NAIP data. Plot showing band two (green) of the NAIP data from 2015. Remember that when you import a raster dataset into Python, the data are converted to a numpy array. A numpy array has no inherent spatial information attached to it and is just a matrix of values. This makes processing the data fast. The spatial information for the raster is stored in a .meta attribute. This metadata allows you to export the data as a geotiff or other spatial format. Next plot each band in the raster. This is another intermediate step (like plotting histograms) that you might want to do when you first explore and open your data. You will not need this for your homework but you might want to do it to explore other data that you use in your career. Earthpy contains a plot_bands() function that allows you to quickly plot each band individually. Similar to plotting a single band, in each band “color”, the brightest pixels are lighter in color or white representing a stronger reflectance for that color on that pixel. The darkest pixels are darker to black in color representing less reflectance of that color in that pixel. figsize: a tutple of 2 values representing the x and y dimensions of the image. cols: if you are plotting more than one band you can specify the number of columns in the grid that you’d like to plot. Plot showing all NAIP data bands from 2015. Previously you have plotted individual bands using a greyscale color ramp in Python. Next, you will learn how to plot an RGB composite image. This type of image is similar in appearance to one you capture using a cell phone or digital camera. A "true" color image consists of 3 bands - red, green and blue. 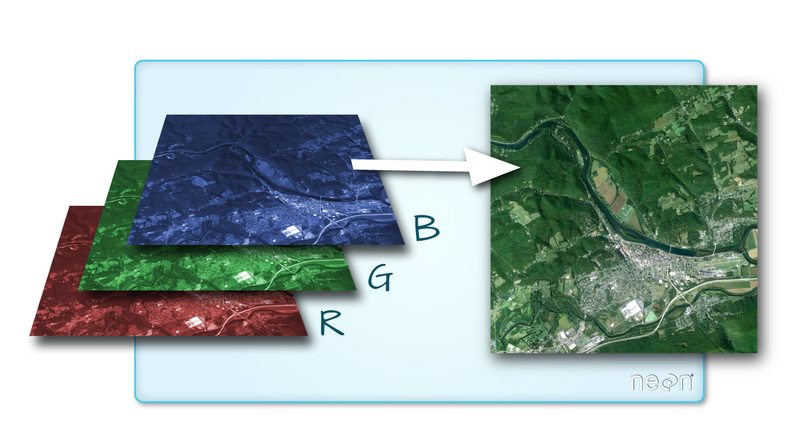 When composited or rendered together in a GIS, or even a image-editor like Photoshop the bands create a color image. Source: Colin Williams, NEON. title: OPTIONAL - if you want to add a title to your plot. Similar to plotting with geopandas, you can provide an ax= argument as well to plot your data on a particular matplotlib axis. RGB plot NAIP data from 2015. Optionally, you can also provide the bands that you wish to plot, the title and the figure size. CIR (Color Infrared) plot of NAIP data from 2015. To render a 3 band, color image in Python, you can use the imshow() function. Imshow allows you to identify what bands you want to render in the red, green and blue regions. es.bytescale() ensures that the values in the image are stretched between 0 and 255 which is the range that our monitor can recognize. Plot all of the bands in the NAIP image using python, following the code examples above. Compare grayscale plots of band 1 (red), band 2 (green) and band 4 (near infrared). Is the forested area darker or lighter in band 2 (the green band) compared to band 1 (the red band)? Plot showing the red vs green vs near infrared bands of the NAIP data. Do you notice a difference in brightness between the 3 images? The image above looks pretty good. You can explore whether applying a stretch to the image improves clarity and contrast. Below you use the skimage package to contrast stretch each band in your data to make the whites more bright and the blacks more dark. 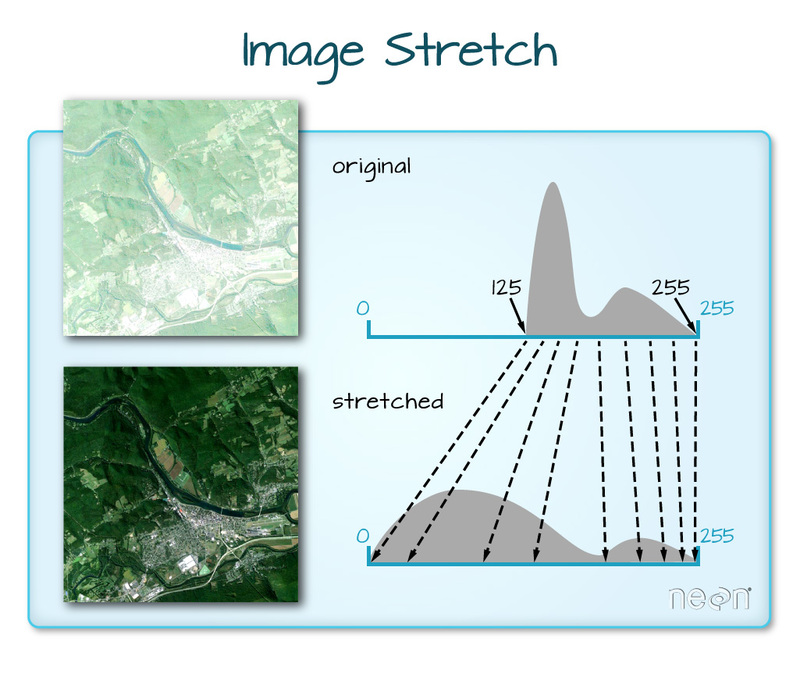 Data Tip: Read more about image stretch on the scikit-image website. For convenience we have also built a stretch feature into earthpy. You can call it using the stretch argument. Plot showing RGB image of NAIP data with a stretch applied to increase contrast. 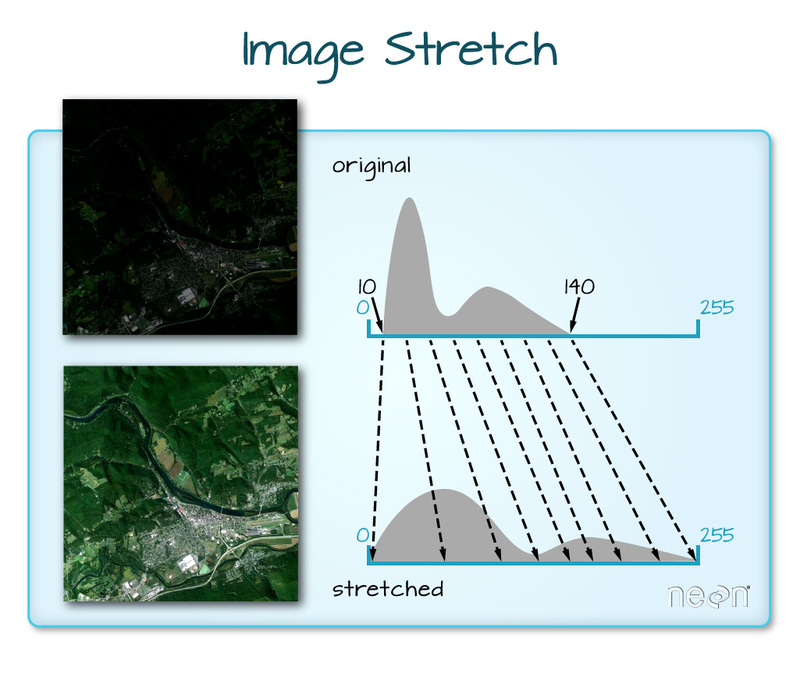 In this case, the stretch does increase the contrast in our image. However visually it may or may not be what you want to plot. Just like you did with single band rasters, you can view a histogram of each band in your data using matplotlib. Below, you loop through each band or layer in the number array and plot the distribution of reflectance values. Histogram for each band in the NAIP data from 2015. If you want to understand how the hist function works, have a look at the code below. Here you can loop through all of the bands and plot the histogram for each one.